Hello, everyone! How is your week going so far? I’ve been plagued with migraines since the weekend. But guys, yesterday I got a major haul in the mail! I had ordered polish over a 2 week period from Hella Handmade Customs, the Polish Pickup, Parrot Polish, KBShimmer (including their new lotion! ), and ILNP. It ALL showed up yesterday. Holy Mary, mother of God, was it fun to open it all! Onto today’s polish- Usagi by Takko Lacquer, a new-to-me brand. I first spotted this polish in a thread on Facebook. I believe it was the fan page for 77 Nail Lacquer asking what everyone had on their nails. I spied this beauty and was immediately smitten. Somehow, the girl who had it on had captured the shimmer really well. It’s not as strong in my pics, but it IS strong on! Usagi is described on Takko’s site as “an porcelain light pink filled with green to pink iridescent shimmer.” As I said, the shimmer is very strong in person. One of my favorite things about this polish is that it is opaque in 2 coats- a rarity for a baby pink! The formula is also excellent. I’m in love, guys. I was going to try doing some fine line nail art on this. Turns out the brush I thought was tiny isn’t tiny enough. I think I need a brush with one hair, lol. The lines were a disaster, so no art work today. Are you glad there’s no more green, lol? Thanks for stopping by! 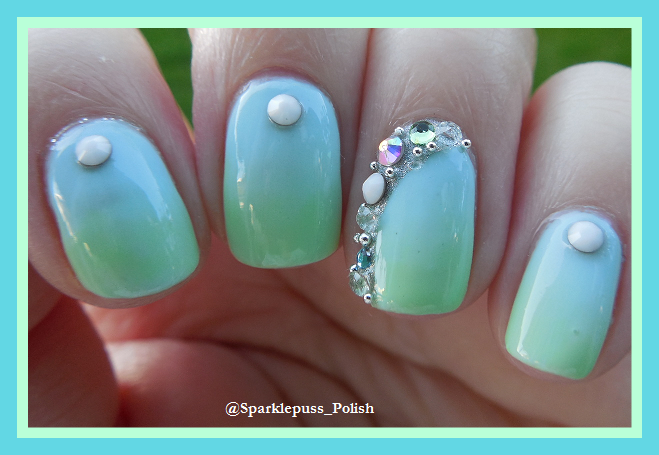 Beautiful polish! I can never find brushes tiny enough either. I have never used Takko Lacquer before but everything I see from them is gorgeous. I used to buy all the Takkos but I haven’t in a long time. She has some cool colors. Take makes some lovely polish. I haven’t perused her shop in a while, might be time again.